Young Rumpelstiltskin watches his charlatan father deal tarot cards for a group of men. One of the men becomes angered and begins beating on him. Rumpel begs the man to stop hitting his father. After the men leave Rumpel tells his father the men took all the money. Rumpel’s father brings him to some spinsters to care for him. He does not want to stay with them. His father lies and tells him he will look for work and then return for him. He leaves Rumpel and gives him his doll. Rumpel masters spinning. The women tell him that he will be able to make a living doing it. Rumpel believes he can make money and reunite with his father. The spinsters tell him that his father is a cheat who is at the pub and not looking for a job. They suggest he forget his father and begin a new life. They give him a magic bean explaining it can be used to open a portal and leave. Just as the spinsters had told him Rumpelstiltskin sees his father at the pub. He goes to leave and his father stops him. He tells his father he has the magic bean and that they can leave together and start over. His father immediately tries to take the magic bean and Rumpel tells him he cannot gamble it away. He father tells him they will leave together. He will take him to a place he went to in his dreams as a child to escape his hard life and that place is Neverland. They open the portal and jump in. Rumpelstiltskin’s father is excited. He tells him Neverland is just like it was in his dreams. He tells his son that things can appear just by thinking about them. A piece of cake appears in Rumpel’s hand. Rumpel’s father then tells him in Neverland you can fly. He tries to fly but falls on his face. He realizes that he needs pixie dust. They do not see they are being followed by a Shadow. Rumpel’s father takes him to a group of high trees where they can find pixie dust. Rumpel does not want to climb the trees. His father tells him to wait and he will be back. His father climbs and finds pixie dust but he still cannot fly. The Shadow appears to him and tells him he does not belong. Rumpel waits down below and becomes worried. He calls for his father. Rumpel’s father comes back to him and hugs him. He tells him that the pixie dust did not work because Neverland is only for the young. His father goes on to say he will be never the father he needs. Rumpel asks him what he is trying to say. Rumpel’s father tells him that a child cannot have a child and therefore he needs him to leave with the Shadow. 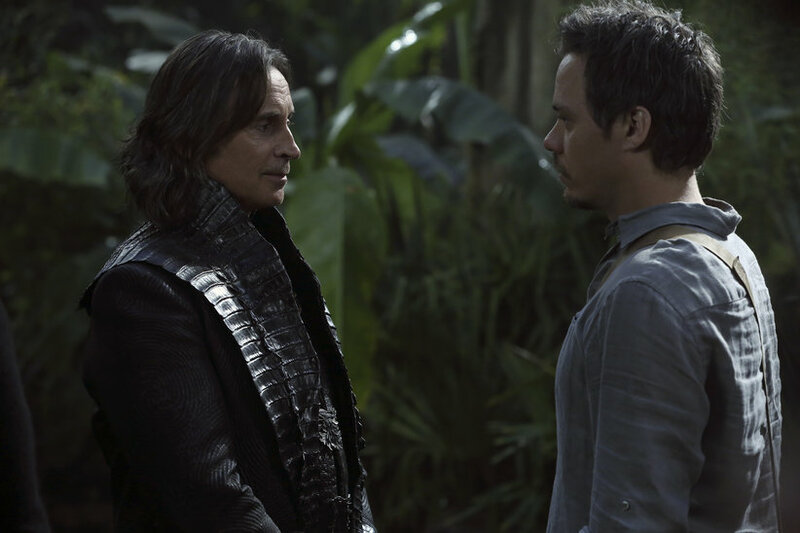 The Shadow grabs Rumpel who begs his father not to let him go. Once the Shadow lifts Rumpelstilstkin he sees his father transform in to a boy. His father is Peter Pan. The doll drops by Pan’s feet. Rumpel returns to the spinsters. They try and comfort him. He tells them they were right about his father who has abandoned him. They ask where his doll is. He tells them that Peter Pan is gone. Pan is led by the Shadow to Skull Island. The Shadow explains that he has defied the laws of Neverland so once that hourglass runs out he will lose his youth. Pan vows to find a way to stay young forever. Peter Pan tucks Wendy in who pretends to be sick for Henry. Pan brings Henry to the Lost Boys and announces tonight he will save magic. I tell Rumpel that I am glad we teamed up. I tell him how the group became distracted when Pan made up a story that Neal was alive. I am surprised when Rumpel tells me that this is actually true. I ask what happened with Neal and he dodges the question. Instead he tells me to be rest assured that father and son will be reunited. This statement takes a stab at me. We are reunited with Emma and the rest of the group. I show them we have Pandora’s Box. Neal tells us about the prophecy and not to trust Rumpel. We all turn on him. He tells us he has no intention of hurting Henry. He reminds us that of our group he is the most powerful and we need to trust him. He agrees to give Neal Pandora’s Box to show his sincerity. Neal asks Rumpel what the story is between him and Pan. Rumpel simply tells him that Peter Pan destroyed his father. Emma asks Hook if there is another way that David can survive off the island. She is interrupted by Rumpelstilstkin who reminds them he once survived Dreamshade. He tells them that he can create an elixir. Neal tells him he needs to save David without asking to make a deal as it is the right thing to do. Tinkerbell leads us to Pan’s perimeter. Neal stops Rumpel from using magic on the Lost Boys. This does not stop me as I do it instead. We do not see Pan among them. We hear someone call for help. We find a girl in a cage. Wendy is shocked to learn that Neal is Baelfire. He asks what happened and she tells him she came back to Neverland to save him. We set up camp. Neal asks Wendy about Henry. Rumpel can immediately tell her answers are lies. Wendy tells us that she is trying to protect her brothers as Pan is keeping them alive. She opens up and admits Pan has tricked Henry into thinking he is saving magic but Pan really wants his heart to become immortal. She tells us that once Pan takes his heart Henry will die. Pan and Henry arrive at Skull Island. Pan immediately casts a protection spell. Mary hugs Emma when she hears Rumpel may be able to save David. They plan to bring spring water to get him back to Storybrook. I arrive at Skull Island with Neal, Emma and Rumpelstiltskin. We cannot get through because of Pan’s protection spell. Rumpel is able to walk through because he is separated from his Shadow. We give him Pandora’s Box back. Once he leaves I believe by combining my magic with Emma’s it will be strong enough to get us through. We get to work. Pan takes Henry to a chamber with an hourglass. The hourglass is almost empty and Pan does not have much time. Pan hears a noise and tells Henry he will be right back. Pan and Rumpel are face to face. He asks Rumpel why he has not told anyone he is his father. He then tries to tell Rumpel this is their chance to start over together. He tells Rumpel he should be understanding now that he too has once abandoned his own son. Rumpel snaps back that they are nothing alike. Pan tells Rumpel despite what he thinks he does care for him and that is why he called himself Peter Pan. Rumpel tries to use Pandora’s Box but it will not work. The charlatan Pan has switched the boxes and is holding the real one. He opens the box and it traps Rumpelstiltskin inside. Pan returns to Henry to finish what he started. He tells Henry he needs his heart. They take his heart out and Henry holds it. Realizing Henry is not keen on not knowing what will happen to him as magic comes with a price, Pan lies and tells Henry the price is he will have to remain on the island. We arrive and try to stop them. Henry is listening to us tell him that Pan is a liar while Pan continues manipulating him. Believing he is doing something heroic Henry gives his heart to Pan who shoves it in his own chest. Henry collapses and Pan flies above us. He smirks as we surround Henry’s lifeless body.